The UK heavyweight 12 metre single deck market has declined markedly in importance over the years in the face of rising sales of midi and lighter weight alternatives but there remains a level of demand, mainly for more topographically challenging routes but also for specialist applications where robustness is paramount, such as guided busways. Prior to Euro6, Volvo met the demand with the low entry, rear engined, B7RLE chassis. 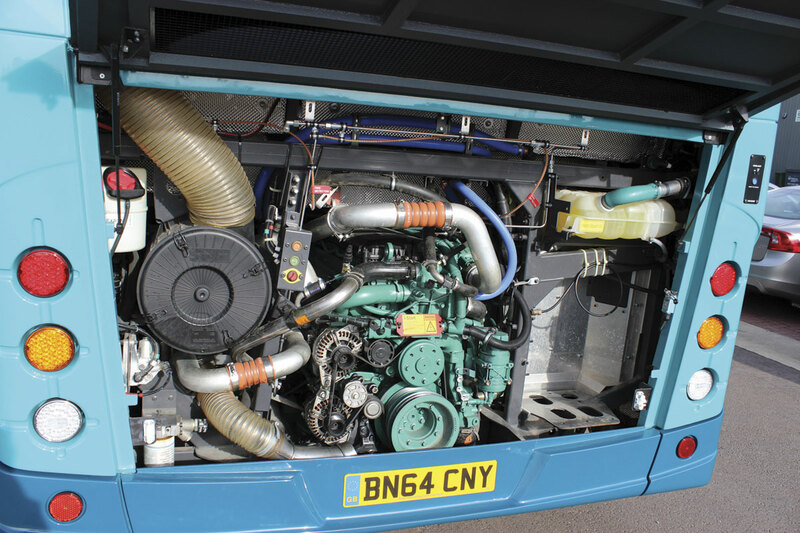 Euro6 has necessitated a change of power unit and, unlike the double deck range which downsized from a nine-litre unit to the five-litre D5K used in both the B5LH and the B5TL, the B7RLE has become the B8RLE, equipped in this instance with the 7.7-litre D8K.280 unit producing 280hp at 2,650rpm and peak torque of 1,050Nm at 950-1,700rpm. Both 320hp and 350hp outputs are also available from the D8K but these are to be found in the B8R coach range. The first of the bodybuilders to develop its range to provide a body for the B8RLE is MCV the Egyptian coachbuilder with its UK headquarters at Sutton near Ely. 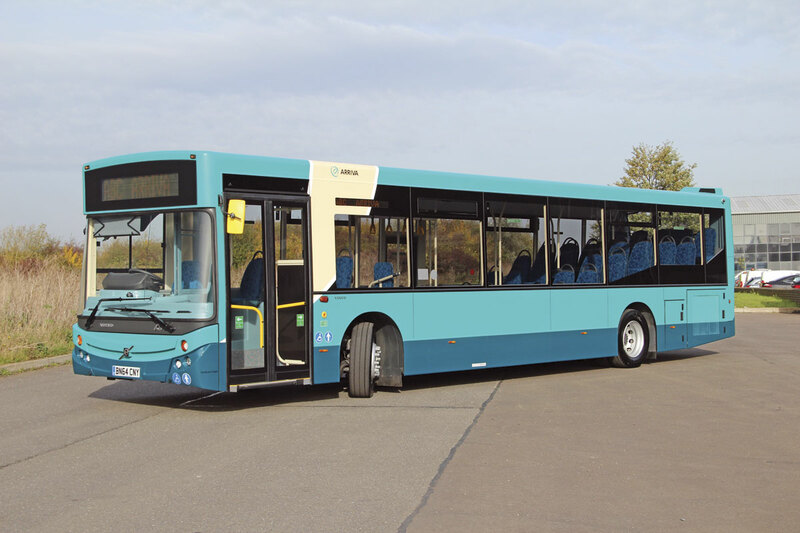 Last week Stuart Jones went there for a first look at the bus before it goes into trial service with Arriva The Shires from its Luton depot. He was welcomed there by Volvo City Bus Product Manager, Adrian Felton, and MCV Director, Ashraf Fawzi and his team. MCV and Volvo have been working together closely for the past few years and there are now over 50 MCV bodied Volvos operating in the UK under an agreement whereby Volvo takes full responsibility for their sales and marketing. 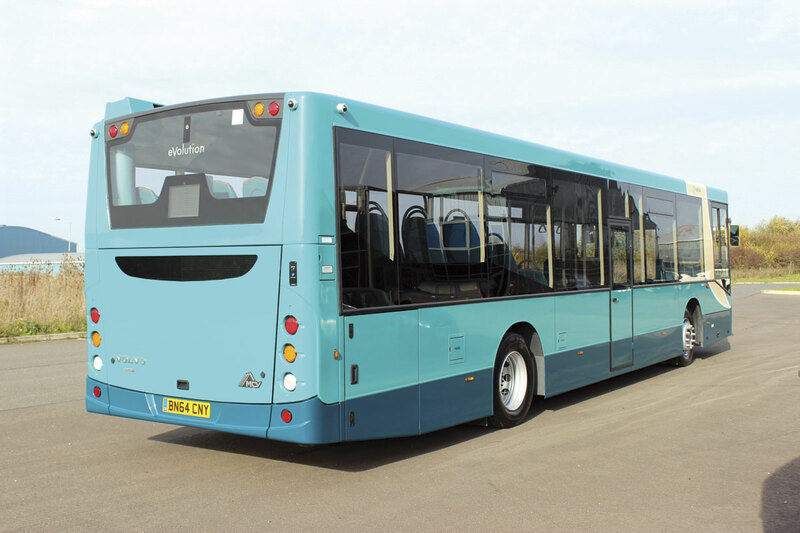 After first launching a body on the B9TL double deck, MCV followed with its single deck option on the B7RLE in April 2012 when three began operating for Pulhams of Bourton on the Water where they replaced high floor coaches. Earlier this year we spoke to Simonds of Diss and Pulhams about their experiences with the B7RLE MCV123 (see B&CB issue 1292, 5 September 2014) and they were both very positive about the vehicles and the support provided by both manufacturers. The transmission is the ZF 6AP1200B Ecolife six-speed fully automatic transmission designed to enable fast changes with no torque loss. 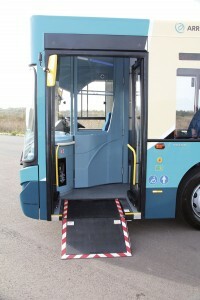 It incorporates a neutral bus stopping facility that automatically shifts to neutral prior to coming to as standstill. The axles are the Volvo RS1228C at the rear and the RFS-L at the front. Various fuel tank capacities are offered. The original tank held 330-litres but this has been reduced to 280-litres with an option of 250-litres though the size of the unit is always the same, the holding controlled by an internal choke. The AdBlue tank holds 30-litres, a reduction from the previous 45-litres. Across the range coolant sight glasses have been abandoned in favour of an LED push button check, mounted on the rear offside corner panel. The air suspension is electronically controlled with kneel and lift functions and there are disk brakes all round with automatic adjusters. For Euro6, the B8RLE has been upgraded in a number of ways beyond the change of engine. Adrian ran me through a few more features. The power steering is now an electrically driven hydraulic system, rather than a fully hydraulic system, reducing the amount of pipework running down the chassis. 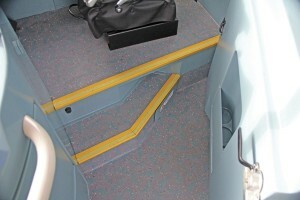 This aspect is common with the B5 double deckers. An Oilmaster automatic lubrication system is now standard (though not fitted on this bus) and the cable harnesses have been modularised. A significant step forward is the surmounting of previous packaging restraints that dictated the use of special remote filling hoses for the diesel and AdBlue. Following re-engineering they can now be direct filled, the AdBlue tank being ahead of the offside rear wheel and the fuel tank beyond it. Preventing starting failures there is the Volvo I-Start system along with ARMS (automatic reset of master switch). If you leave the lights on when you turn off it automatically cuts out if the batteries drop to a certain level. This was not offered on the B7RLE but will be standard on the B8RLE. The electrical system is the new BEA3 system superseding BEA2. It incorporates additional control units and bus input and output units and allows different control systems. 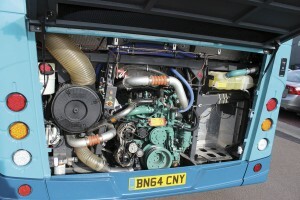 Although not installed on the MCV, there is an external CAN System that the bodybuilder can use. While the change in the double deck chassis models from nine to five litre power units offers the potential for fuel savings, with the single decker chassis the move is in the other direction from seven to eight litres. When I visited Simonds last year they reported a figure on rural bus work of around 10mpg with the B7RLE, though you would struggle to match this on purely city work. Volvo representatives I have spoken to are confident that there will not be a fuel penalty as a result of the change. If, like many, you wonder why the five litre unit was not adopted rather than the eight-litre, I agree that it is puzzling, and I would not be surprised to see such a move at some stage in the future, which would bring with it the potential for fuel savings, though possibly at the expense of a lessening in the useable power that endears Volvos to many of their users. Volvo is committed to the electromobility concept for bus propulsion, underlined by the fact that it does not offer a diesel powered fully low floor bus, preferring to major on hybrid and plug in hybrid alternatives with the fuel and environmental savings they offer. These come at a price, and while sales of these pioneering buses is going well, the B8RLE is left as the only diesel option in a range that includes no midi, lightweight or mild hybrid alternatives. The are a number of other possibilities for it, as a 15m tri-axle Irizar i3 shown on Volvo’s stand at the FIAA show in Spain last week demonstrated. Built using a stainless steel frame, the C123RLE has GRP side panels, bonded, tinted side windows, a one-piece front screen, Ventura door systems, Doga wipers, a manual Compak entrance ramp; upgraded blown convector heating and front, side and rear electronic destination displays. LED exterior lights are standard all round with the exception of the Hella headlights which are halogen. Although the attractive frontal aspect and general styling of the C123RLE is retained, quite a considerable number of enhancements to the body used for the B7RLE have been introduced for its successor. Significant among these is an increase in height of 100mm taking the overall total to 3,000mm from 2,900mm. This dimensional change is coupled with a lengthening of the wheelbase from 5,950mm to 6,100mm and the overall length growing from 11,970mm to 12,120mm. These changes allow a number of objectives to be achieved, including an increase in headroom at the rear of the saloon; it was always a little lacking at the rear of the B7RLE. Of the extra 100mm, roughly 80mm is added to the headroom (taking it to 1,120mm from 1,040mm at the rear) and 20mm is required to counteract the additional height of the B8RLE chassis. With the extended wheelbase comes an altered step arrangement and 10mm shallower steps to make the ascent to the rear of the saloon more gradual, increasing the feeling of spaciousness in the process. This is further accentuated with a reduction in height of the front wheelarch boxes. With the raised roof, MCV has redesigned the interior coving and panelling to make it simpler in appearance. 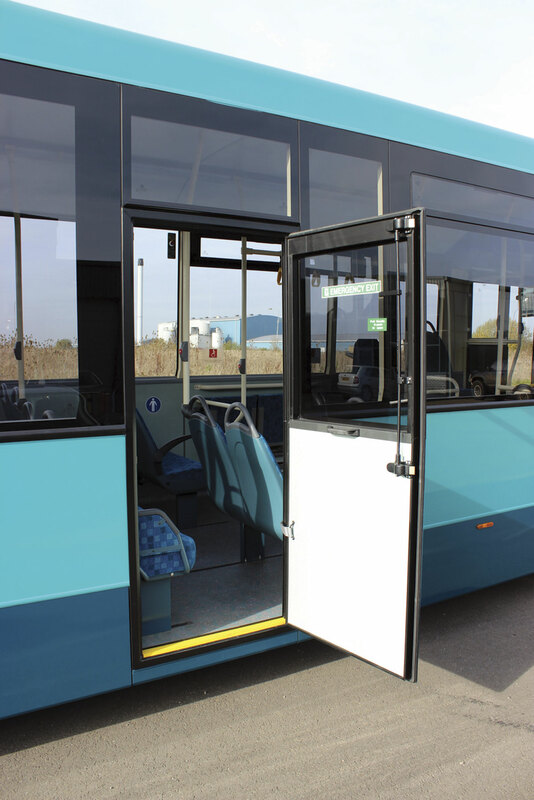 Acting on customer feedback, the LED interior lights have been retained but the manner in which they operate has been changed so that those in the entrance area dim when the doors close. Beyond the entrance the forward section of lighting is coloured blue as this cuts down on reflections, and the remaining two thirds of the bus has bright white units. Operator’s can determine what level of lighting they want in each bus. There is also a cleaner light activated by a button above the passenger door, running for a set time to allow cleaning without the cleaning staff having to touch the driver’s controls. Window unit sizes remain the same, the additional height is all located within the cantrail. Glass is 4mm thick. It was a concern for Volvo that increasing the height might increase the weight which, on paper, had already risen by around 200kg with the change for Euro6. However, by working together, optimising the body structure and changing the fuel and AdBlue tank specifications the new model is within 20kg of the old one. The test bus tipped the scales at 10,680kg compared with 10,660kg for a similarly specified Euro5. Electrically, the body is now far more integrated with the Volvo chassis, as it has had to become, a benefit of which is a reduction in the number of components. The loom harness, which is fully numbered for identification, will be common with other forthcoming Volvo based products. A regular complaint about modern low floor buses is the lack of seating capacity they provide compared with earlier high floor designs. 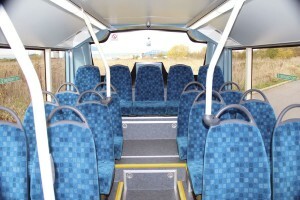 In this the MCV does relatively well as it can accommodate up to 46 seats, two more than the B7RLE version. 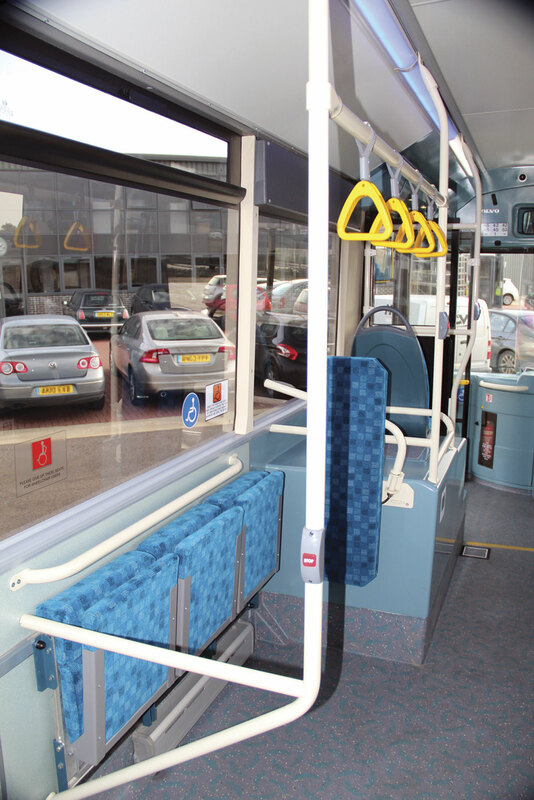 The bus that will be on test with Arriva is fitted with Esteban Civic V2 units mounted on tracking at the operator’s request. For those that require seatbelts, a layout with 43 forward facing Vogel Arondo belted units plus three tip-ups is available. 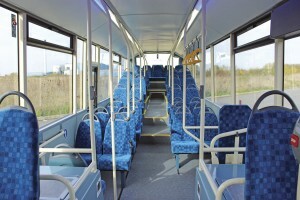 Quite a number of other interior layouts are also offered, and the theoretical maximum capacity is now 100 passengers. 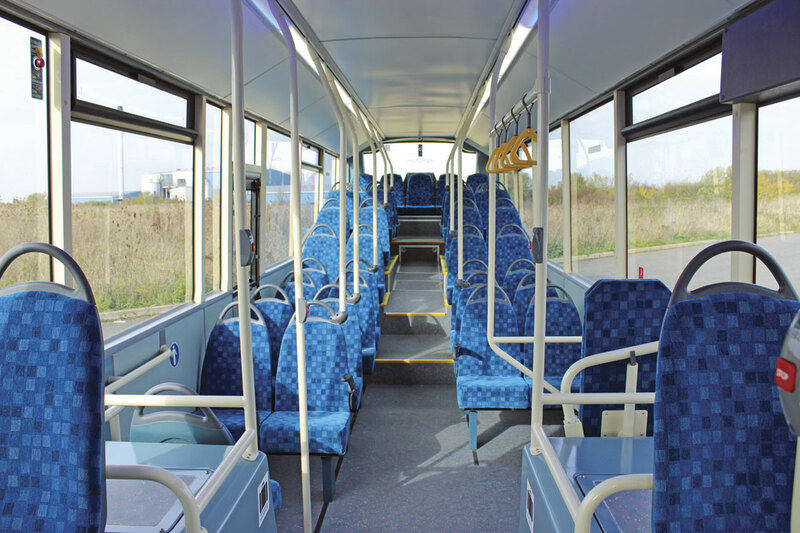 A TfL specification dual door bus could be supplied with 39 seats and a standee capacity of 60, only one short of a three figure total. I was shown a plan for an airport bus specification with two nearside and one offside door that provided space for 34 seated and 66 standing passengers. On the forward edge of each of the front wheelarches is a single seat. 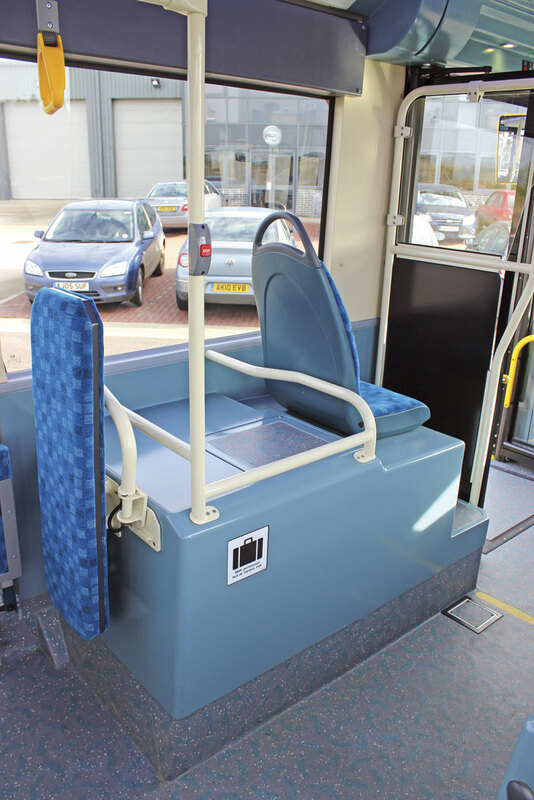 I thought a one and a half width ‘mother and child’ seat would be preferable but was told that, while it can be supplied, operators did not want to pay the extra money to have such seats installed. 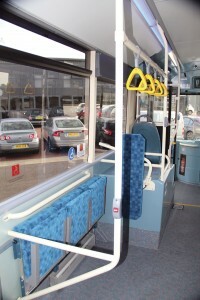 Other Arriva specified features include a Fogmaker fire suppression system, a Chapman driver’s seat and a 21st Century nine camera CCTV. Other systems could be supplied if necessary. 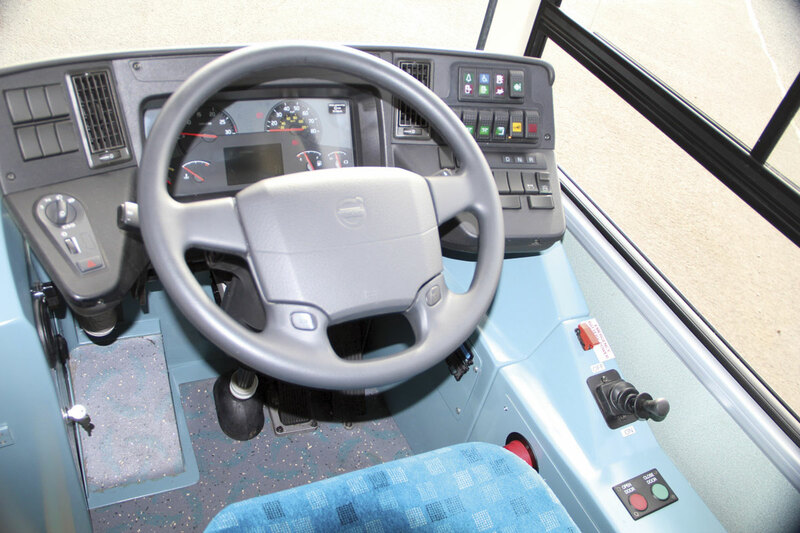 Common across the B8RLE and double deck ranges, Volvo has gone back to a fully adjustable dashboard that has been developed specifically for the UK with a shortened left wing to provide space within the cab for the ticketing machinery. The idea of the cross model commonality is that anyone entering the cab should be familiar with their workplace. Apparently, it is possible to opt for a less highly specified instrument panel without the fuel gauge, boost gauge and certain other display functions, though the potential costs of running out of fuel on the road suggest this might be a false economy. He found the cab spacious but the dash difficult to position accurately because the wheel and dash move together rather than separately, eventually finding somewhere comfortable, if a bit high. The one thing he didn’t like was how low the overhead unit containing the reversing monitor and heating controls was, something that Ashraf Fawzi said MCV had already identified and would remedy. The entire driving position set up is new for the B8RLE. 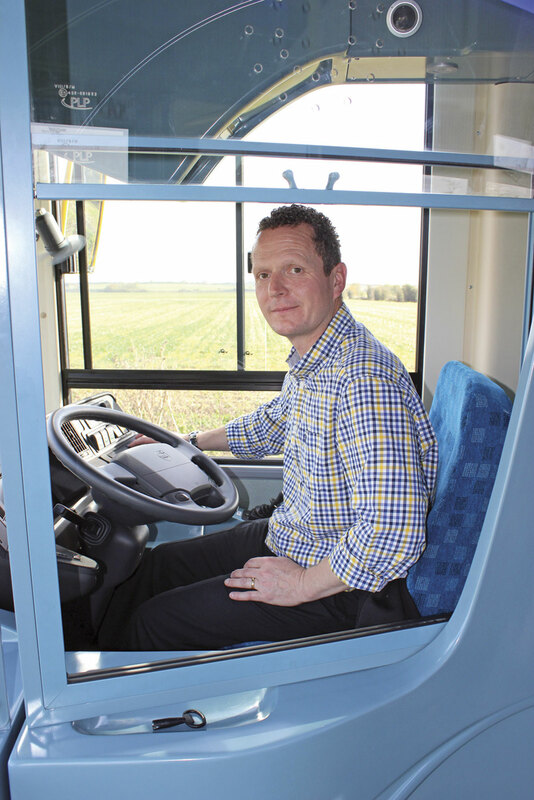 Once on the road it didn’t take Simon long to conclude it was ‘just like driving a coach.’ There was praise for the steering, the good lock – demonstrated turning into a road at a 45% angle – the ride and the way it sat on the road. Simon thought it sometimes a little sluggish changing, something Adrian attributed to it being in Super Eco mode rather than Eco. Throughout the drive he was aware that it did not go out of the green band at all ‘even when you give it some wellie.’ He added, ‘it doesn’t rev much, we’ve not been over 1,500rpm at any time, though it certainly performs well enough.’ At 45mph it was recording nearly 1,400rpm in top gear. Dew’s Chief Engineer, Tom, took a look round the rear end and was critical of the difficulty he would have faced in changing some filters. He thought a bracket that blocked his access to it needed relocating. Looking closer at this I was not sure whether removing an unnecessary mounting plate for an air conditioning unit to the left of the bay would have created the access required. Otherwise it appeared to me that an exceptional job had been made of making all components accessible with wide opening hatches at the rear and sides, and saloon floor hatches in important areas of the saloon floor. Tom also mentioned how quiet the bus was. From the passenger viewpoint, I found it noticeably quieter than the B7RLE, stable and relatively rattle free though there was something within the cove at the rear offside that made a noise. That the finish was as good was remarkable as it had been built not on the line but in the prototype shop. The claims made for the effectiveness of the heating system were well proven, though it was particularly mild. There were a few places where it was too easy for passengers to deposit litter, especially behind the rear five place seat, but the 70mm additional headroom in the rear corners transformed the experience for anyone sitting in the final row. It felt very stable and solid though I did notice window shimmer within the centre-most bays. Another minor detail that MCV had picked up was the need for some kind of securing system for the upper edge of the full height driver protection screen. MCV remain strongly committed to the UK market and in addition to developing the C123RLE for the B8RLE, they are in the process of designing a completely new double deck body for the Volvo B5TL and B5LH double deckers, having decided to adopt a new style for Euro6. This investment is despite the fact that they probably didn’t see a return on the money spent on the B9TL product. The design will be modular and enable a number of new alternatives to be offered including lowbridge, standard height and open top. Longer options will be possible too. In the past MCV was limited to the 5,150mm wheelbase and 1,920 front overhang but in future there will be 5,400mm, 6,300mm and 7,000mm options with a standardised 1,680mm front overhang. 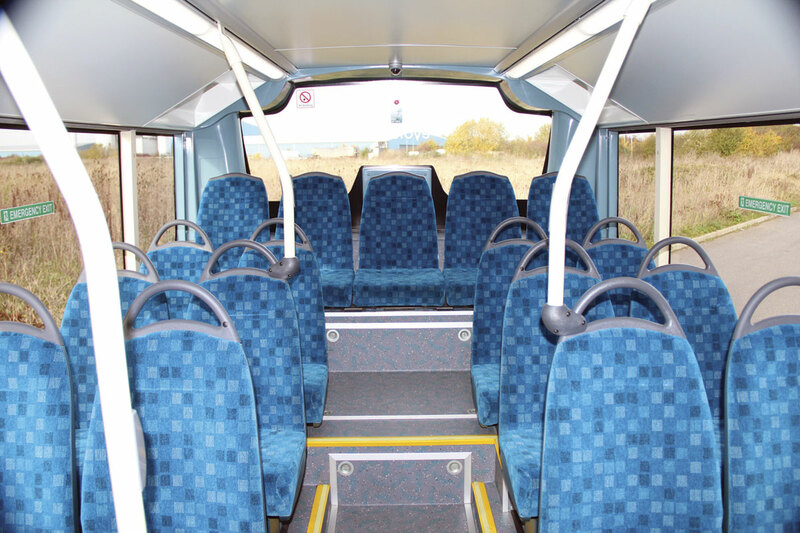 Higher seating capacities than the B9TL will be possible. Not only is MCV investing in new products, it is improving the way in which they are designed. The double deck will be the first MCV product designed in 3D rather than 2D as the C123RLE originally was. A DMU (Digital Mock Up) capability has also been added. Adrian pointed out how proactive MCV were in wanting to improve their products, something operators have noted in the past. He referred to an audit carried out at the factory, the results of which were cascaded to the workforce on every line. 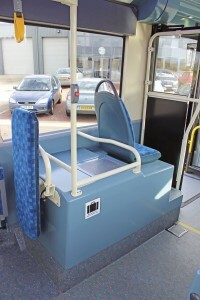 Having looked at and travelled on the B8RLE, it is a bus that offers passengers a very agreeable travelling experience, drivers a comfortable working environment, engineers a relatively straightforward maintenance task and operators a bus that will stand up to a harsh working environment for a prolonged life. Compared with its predecessor, the B7RLE, it is significantly quieter and the other enhancements add to the appeal. The MCV C123RLE’s higher roof answers the previous headroom issue at the rear of the saloon and the new ceiling treatment works well. The one weakness of the bus is the likelihood that it will use more fuel than lighter weight alternatives, which for some applications and operators is an acceptable trade off for the enhanced comfort, reliability and durability they expect it to provide. If the B8RLE MCV123 were to appear on any route I was travelling on I’d be more than happy and I wouldn’t rule out that happening because the service that stops outside my front door is currently provided by B7RLEs operated by Delaine Buses!